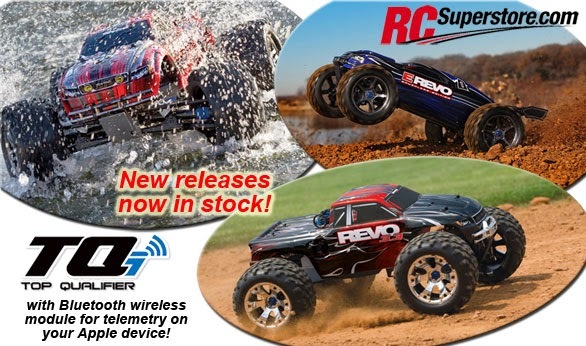 Traxxas New Releases In Stock at RC Superstore! Traxxas recently upgraded several models to the new TQi 2.4GHz radio system, featuring Bluetooth wireless compatibility through the Traxxas Link App for Apple iPhone (4S, 5, 5C, 5S), iPod touch (5th generation and later versions), iPad (3rd generation and later versions), or iPad mini. Gone are the clunky controls and blocky monochrome graphics of yesterday's radio systems. This powerful app gives you complete control over the operation and tuning of your Traxxas radio controlled model with stunning visuals and absolute precision. Install accessory Traxxas Link telemetry sensors on the model, and Traxxas Link displays real-time data such as speed, RPM, temperature, and battery voltage with brilliant graphics. Traxxas builds the world's fastest Ready-To-Race radio-controlled models. That level of performance demands precision control. Traxxas Link gives you the tools for exacting adjustment and superior control while always keeping you informed on your model's status and speed. These vehicles are in stock, so check them out today!